There’s a bit of Sunday heaviness come to Trillians as Downcast Studios are very happy to present the amazing Night Demon, Mythra and more, all at the notorious Newcastle rock bar on Sunday 12th November. One of the hardest working bands in Metal today, Night Demon arrive from the States ready to tear things up. Their high energy is something they’re already well known for, and the trio are set for big things, so as with many bands, saying you saw them in Trillians first is a must. Mythra need little introduction, as one of the originators of the new wave of British heavy metal music back in the late ’70s and early ’80s. They still play sell out shows worldwide. There’s also the lowend groove and total riff fest that is Dirty King to round it all out. It’s a show of blistering heaviness that you’d be mad to miss. 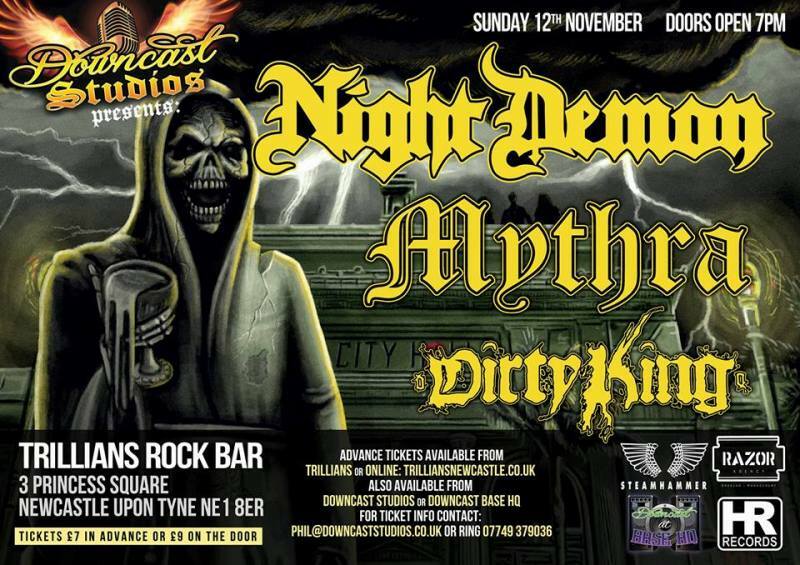 Night Demon, Mythra and Dirty King play Trillians, Newcastle on Sunday 12th November.